The 400 Class Pintle Chains is a lightweight,moderately priced chain capable of handling average loads at slow or intermediate speeds. 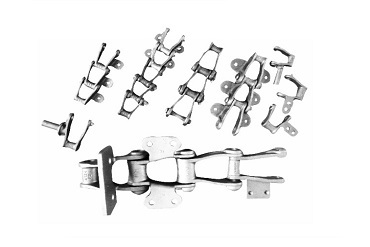 500 Class Bucket Elevator Chains is a heavyweight, moderately priced chain capable of handling average loads at slow or intermediate speeds. 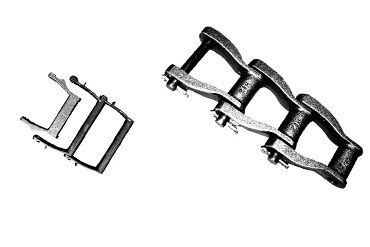 600 Class Ley Bushed Chains sometimes referred to as "Cement sleeve chain" or "intermediate carrier chain" is used extensively in Cement mills. 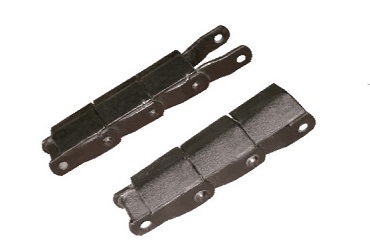 Our long pitch 700 Class Pintle Chain offers maximum strength at minimum weight. 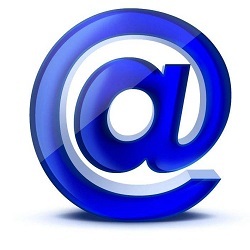 It is totally used for sewage plant applications as well as other conveying and elevating uses. 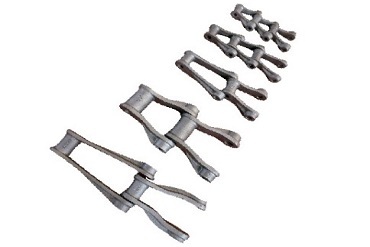 Boiler Moving Grate Chains are links cast of malleable iron or Primal (Duramal). 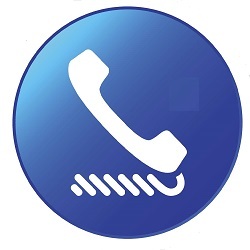 It is a heat treated malleable iron having greater strength and superior resistance to wear and abrasion. 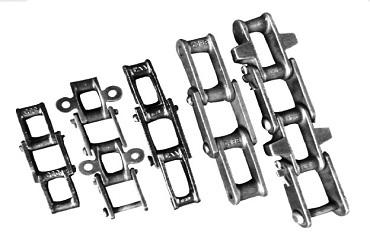 The Crate Conveyor Chains is constructed in malleable iron and the steel connecting pins are riveted flush with the side bars to enable the chain to slide freely in 2.5"channel guides . Combination Chain Is used extensively in the cement.paper and pulp, quarrying, and mining industries for elevating and conveying a wide variety of abrasive and non-abrasive materials. 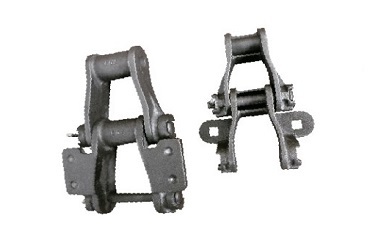 Pintle Chain is suited a wide variety of agricultural and industrial applications. 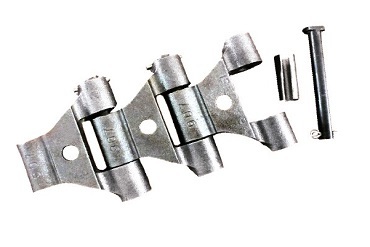 The chain utilises all heat treated components with riveted pin style. 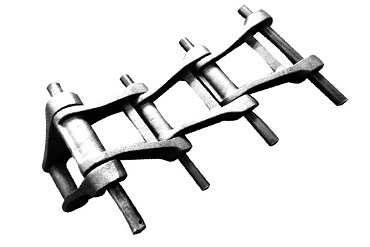 Drop Forged Case Conveyor Chain offers the special features of maximum strength without excessive weight and resistance to lengthening even after extensive operation. 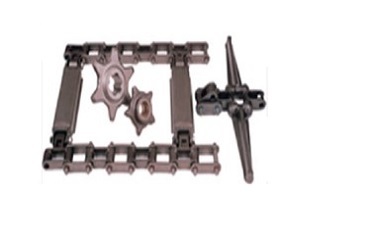 H Class Mill Chains is an extremely strong, serviceable chain originally designed for heavy drives and transfer conveyor purposes in saw mills and the paper and pulp industry. 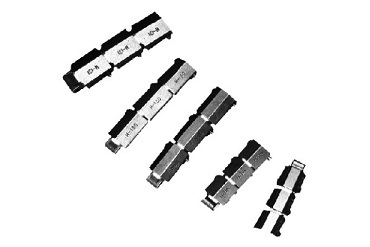 Transfer Chain is available in two types: "H" Class Transfer Chain and Combination Transfer Chain. 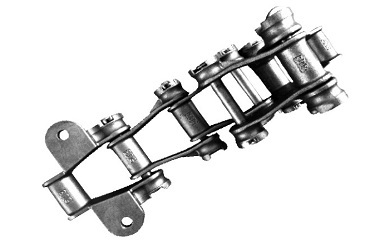 All "H" Class Transfer Chain is available only in riveted construction. 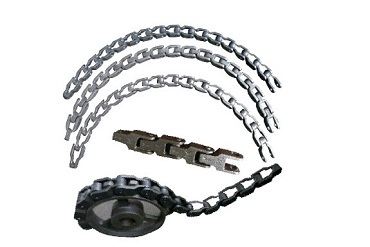 MC 33 Double Flex Chain is a detachable-type chain with a rugged, double flex design for both horizontal turning and variety of applications in dairy, bottling and related industries. 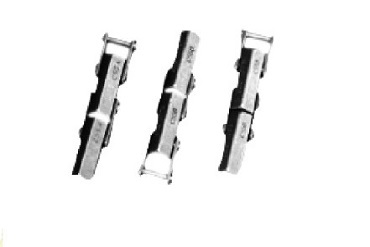 The Mining Conveyor Chains & Crawler Chains are medium carbon steel. 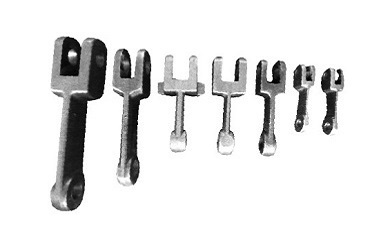 Pin are medium carbon alloy steel and are the hardened for maximum chain life. 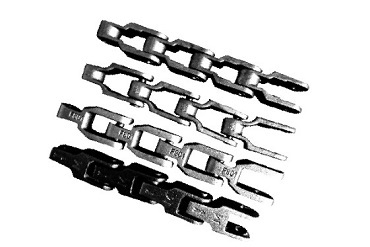 The Rivetless Drop Forged Chain is highly regarded as one of the strongest chains ever developed, and has found application in many industries. 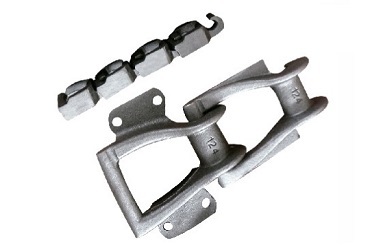 Rivetless Drop Forged Chain is used extensively for flight conveyors. 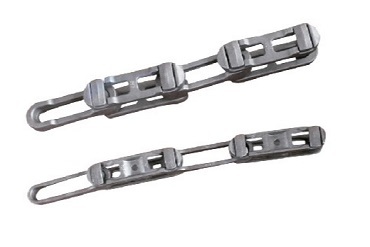 Welded steel mill chains are recommended for conveying, driving, and elevating applications where a high-strength steel rollerless chain is required. 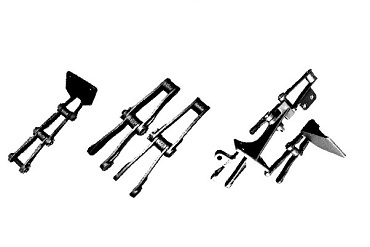 will operate on the same sprockets as their cast chain counterparts. Copyright © 2018.Ever-power Industry Co., Ltd. All rights reserved.